A couple of hours before the New York premiere of his film Mumon: The Land of Stealth at the Japan Society’s Japan Cuts, director Yoshihiro Nakamura sat down with me for an interview. Mr. Nakamura will be forever referred to in the US as one of the writers of the film Dark Water, however any lover of world cinema knows he is so much more directing films such as A FISH STORY, GOLDEN SLUMBER, CHIPS, THE MAGNIFICENT 9 and A BOY AND HIS SAMURAI all of which played at Japan Cuts over the last decade. Talking with Mr Nakamura was quite simply one of the coolest things I’ve ever done. What was so cool about it was that everyone in the room became involved in the conversation in one way or another via small talk. 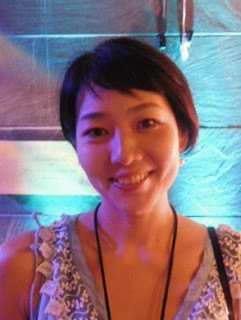 In addition to myself and Mr. Nakamura was his charming wife Yumi as well and translator Amber Noe. It was pure magic as business morphed into something else. The conversation largely focused on Mr Nakamura’s films and taste in films, but it wandered into other subjects such as the map of Manhattan tie I was wearing and the monster bag I always carry. I didn’t want it to end and I don’t think Mr. Nakamura did either since he offered to keep answering questions even after they came to drag me away. Regrettably, in the interest of readability I’ve had to trim much of the small, and often silly, talk. The small talk and asides turned the interview into a 30 minute laugh fest which had the people at the Japan Society wondering what we were up to. However as much as I would love to publish the entire unedited talk with all of the asides, I found that I’ve had to remove them because they didn’t read well (they frequently referenced things said in Japanese not fully translated or tangents not followed). Hopefully I will be able to post the audio on line so you all can hear it all. I want to thank Shannon Jowett and everyone at the Japan Society for setting this up. I need to thank the wonderful Amber Noe for her excellent translation. And of course I need to thank the Nakamuras for taking the time to talk to talk to me. I am in your debt. And now the interview, beginning right after the Nakamuras and I discussed my monster bag and we were all finally sat down to formally talk. Steve: Um, I have to apologize. I've not seen MUMON yet. I'm seeing it tonight. The reason is, I've seen everything that you’ve directed that's played here in New York on the big screen and the one film that I was not crazy about was the one I saw on a screener. So, I wanted to see it on a big screen because I've loved everything else you've done. Which is actually a way to start. Uh, you've done TV, you've done films, and you’ve done direct to video. Do you have a preference for the way your films should be seen? Do you have a preference for the type of films that you make? Steve : How do you, at this point in your career how, do you initiate for your projects? Yoshihiro: Up until four years ago I was just getting offers from producers, but the last three years I’m getting offers from publishers. The novelists will ask me directly to make a movie out of their novel. I will receive the order from the novelist directly and I will find a producer to do it for him. Alternatively, I will read a novel and think, "Oh, this would be a good adaptation," and I would discuss it with a producer. Steve : Now I know why so many of your films are based on novels. I was curious because in America, everybody "wants to make my own thing." So many films that are based on the work of Kotaro Isaka , you've done four or five of his stories. Why have you made so many films based on his stories? Yoshihiro : We have very similar film, taste in film, Joel Coen. M. Night Shyamalan. So, from the first film that we collaborated on in 2007(THE FOREIGN DUCK, THE NATIVE DUCK AND GOD IN A COIN LOCKER), and after that for FISH STORY and GOLDEN SLUMBER, Mr. Isaka, brought his novels to me and said, "What do you think? Can this make a good film?" Steve: I find it interesting that the way your taste in what you're choosing with the novels has resulted in these wonderful films like A BOY AND HIS SAMURAI which is a movie, I love. Steve: I wish you could've been there when that played her in New York at the festivals when everybody was walking out going, "Why have we never heard of this? This is, like, the most wonderful thing." I love that film. Um, but you go from that and then you do something INERASABLE which scared the living crap out of me. It is probably one of the top three scariest films I've ever seen. When I watched it, I didn't sleep that night. I've shown it to a couple of people and they didn't sleep. It's like, "Don't show me that. Please don't ever show me another movie..."
But then you have the light films, you have the dark mysteries of SNOW WHITE MURDER MYSTERY. You bounce between styles, you're almost a hard director to categorize. If you, if you could do one type of film what would it be? Or more where are you as a person? It's like you've got these extremes of these wonderful, lovely films such as A BOY AND HIS SAMURAI and these terrible murder mysteries. Yoshihiro: Challenge. Each time it's just about challenging and if I make a mistake then I won't do it again. Steve: I don't think you've made any mistakes yet. Amber Noe: He likes watching horror. Steve: What type of horror do you like? When you want to watch a horror movie, what do you watch? Steve: NIGHT OF THE LIVING DEAD all that. I should, I should have you sit down with my brother and the two of you can talk zombie movies all night. Steve: Forgive me for asking but are you ever scared of living with him with, you know, with this level of horror and darkness? Steve: You have this knack of fragmenting the narrative, like in, A FISH STORY I love watching A FISH STORY with people because they sit there confused going "What...? What is going on with this?" Then it comes together at the end. And it's like, "Oh, wow, that's so cool." Do you restructure the novels when you're making them into films? Or are the source novels like that? And if it's the source novels, do you look for things that are fragmented, with all these different time lines or things going on at different times? Yoshihiro:I'm trying to recreate the feeling that I have when I read the original novel and it's at the end when it comes together and I feel like, "Oh, you got me," and it's very, just, startling, I want to recreate that feeling for the viewer. One other thing I'm careful of is, each time I finish an edited product, I decide to forget about everything and watch it from the perspective of an audience who's seeing it for the first time and try to check if, if you have the same startling feeling at the end. Steve: Is it like, in America, with the big studios, where there's so many different hands in the production? Or do you have final say? Do you to test it with audiences or do you just say "This is it. I'm ready," and it goes out? Basically do you have to answer to different people? Yoshihiro: It doesn't matter how big the production is, it's the same. I have core staff members and camera so, it doesn't really change how big the production is, I can maintain and recreate that feeling. Steve: Does anybody interfere with what you want to say on screen? When you finish a film, when you're happy with it, and you say, "I'm done," does anybody, does anybody come in and play with it or does anybody make suggestions past that? Yoshihiro: No. A system has been created so I have all the power to say what the final cut is, yeah, so no one can say, "No," to me. So if there is a producer or someone who's on, on this production, who, if he might say something like, "No," I am aware of that person and throughout the process, I'll be showing it from the screenplay and thinking of doing this or will show an edited, um, uh, sequence and show, "This is how I'm going to do it," and be checking in with the person continuously. So, by the time the product is finally done, if, if that person were to say, "No," I have the right to say, "You're too late. I already went over it with you." Steve: would you ever shoot something, knowing that somebody's going to be upset about it, so you could get something else in? Yoshihiro: No, I don't think so. There is no money in for that. Steve: Jumping back to your early films. You did a bunch of I guess, direct-to-video horror films early in your career and they're, very different than your later films. There's a little less subtlety to them. Which is the type of horror you prefer, more subtle horror than the over, graphic...? Forgive me do you prefer the, the more subtle horror of, like, INERASABLE or some of the, the murder mysteries. There's a very subtle build-up to the horror whereas LIZARD BABY which was released here as, in a series called Dark Tales of Japan there really wasn't. Yoshihiro: The more nuanced version, the subtle version. Steve: I was just curious some people will move one way in their career despite liking something else and you said you like zombie films in so much as they tend to be very bloody and very gory. How did you fall in love with the movies? What made you fall in love with film? Yoshihiro: Itami Juzo. I first saw his films when I was in high school. Itami Juzo was one of the first directors that showed the making of side, the production side of film. I saw that footage of what it's like to be on set, when I was at high school. And then, in university, I started making films and fell in love with making them and that's how it began. Steve: No, personally, that’s why I love films, it's like, just, the movies were always on in the house and then I started to see, this is how you do it, and went "Oh, this is so cool." and fell in love with them more. How do you feel about somebody remaking a project you've worked on? Would you watch those films? Like, would you, you know, watch a remake of it to see how they take the, take the story? Yoshihiro: Not an original. I wouldn't. Steve: I'm curious. I mean most people say they have this one story. Steve: Is there, is there any project where you go, "I want to do that"? You know, "If I can, if I can do that..." is there anything that you would want to do? Steve: Yeah, right now, you know, in the future. Yoshihiro: Um, historical drama. Historical drama, so I’m getting into historical dramas. I'd like to do that more. Steve: You watch how the progression of your career you have this alternating way of going thrillers and horror films, and feel-good films and now MAGNIFICENT NINE and MUMON which seems to be your next mode. Yoshihiro: I only agree to do films, which I empathize with the feeling of the original. So, it happens to be that way but my, the foundation of how I decide to, um, make an adaptation is the feeling that I get. Steve: How far in advance do you have your projects planned out? Do you have like the next film, the next two films, the next three films? Or you just go from one to the next, one to the next? Yoshihiro: Three years ahead. So I have three years of future plans prepared. Steve: That's awesome. That's awesome. Steve: No, it means I've got more films I know I'm going to. I know I've got stuff coming. Can I ask, are you an actress? Yumi: Oh no, I'm just his wife. Steve: It's just that you look familiar. Yumi: Really? Just maybe. So many faces. Steve: No, no, no, no, no. Steve: I'm fine. I'm good. No, it's just, I have, I had to, you know, it's just, like, it's been bothering, it's like, I know you, why do you I know you? And I've never met you before but it's like movies would be the only way. Steve: Have you been to the US before? Have you been here? Have you been to the Japan...? Have you been to Japan Cuts before? Yoshihiro: First time at Japan Cuts. First time in New York. Steve: Oh, good. I thought I was insane. I thought I missed you. Steve: Were you at Fantasia? Did you go to Fantasia a couple of years ago, in Montreal? Amber Noe: He did, yes. Steve: OK, all right. All right. I knew, I knew there was...It's just like, all right. Um, I don't, I have no idea where to go. Amber: Oh, he likes your Manhattan tie. Steve: Oh, thank you. If you want one, I mean, I would give it to you if you want it. Steve: Uh, seriously, if yo wants it, I'll just give it to you. Otherwise go to one of the souvenir shops and you'll see them outside on the racks of 5 for $10 or 5 for $20. That's where, you, you can get all sorts of New York, New York, New York ties, that sort of stuff. Amber: He's going to go get one. Steve: Oh, cool. Absolutely cool. Um, I have no idea where to go. I just, I mean, I could do the, I could do the usual thing of, "What's your favorite film? What's your favorite...? Who's your favorite director outside of yourself?" Yoshihiro: All American directors. Woody Allen. I like him a lot. Steve: OK, that works for me.